On a usual tropical evening in Mumbai I had the pleasure of being at CSMVS where Anil Dharker and Amit Chaudhuri were in conversation over the latter’s new release, Friend of my Youth. 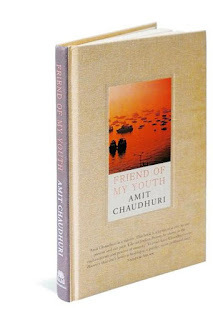 With an ethereal sunset at the Arabian Sea adorning its beige textured cover; this book is a short and crisp novella revolving around friendship and childhood memories in the city of dreams – Mumbai. I think we all have that one city which is a treasure trove of memories for us. Every visit to that city is like a walk down the memory lane. That childhood home where we played hide and seek, a favorite restaurant, secret hangout places with friends, school, college, that lane where we won out first gully cricket match… everything and anything makes that city special. A particular scene that fascinated me the most in the book was when the protagonist Amit Chaudhuri and his friend Ramu are out in a cab and they suddenly notice the houses, the elegant ones which embrace heritage in the safe confines of its crevices. The description shows them looking at the houses transfixed, expecting it to take them into another time. They stare unblinkingly at a city which is the same but is completely different. A transformation which has happened but it still feels familiar. That moment for me describes growing up the best. When we grow up, we still feel the same we did as kids but somehow we know we have changed. Definitions of a lot of things have changed for us and yet we try to hold onto that last thread of childhood, of familiarity which makes us feel secure and gives us a sense of belonging. As I held the book a sense of longing engulfed me for a city that I had fallen in love with 15 years ago- Mumbai. A city that has a sense of aliveness in it despite its vast discrepancies in lifestyles, a city that has grown manifold to make itself the most happening city in the country at the moment and still has hung onto its cultural heritage strongly. If there is one thing stayed with me long after it was all over and by all I mean both the book and the book launch, then it would be the core message of the book –“You cannot control your life!” for that is a complacency we all have grown up with.